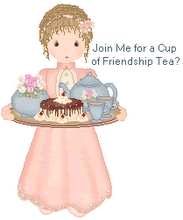 Friendship Tea: Summertime is Family Time! The boys love to go fishin' in the summer. Their favorite local fishin' hole is the front pond at the farm. As you can see, some of the fish are small, and some are big. They catch 'em and throw 'em back in to catch again. This is just one of the many ways we are having lots of fun family time this summer! Looking forward to some of that summertime family fun time!! The best times are those spent with Loved ones. I grew up on an island so our guys were always fishing - though I never did - I was always the one with the hot pan ready for cookin' upon their return home. Come by and enter my giveaway I just posted - I think you will like it!! I would love fishing there with the boys. Do you serve them tea when they come back inside? How funny ... another friend's blog post for the day just included a recipe for fish tacos. I should hook the two of you up!